Most people would agree part of the fun of having a baby is being able to dress them up and tote them around in adorable attire for others to admire. Why else on earth would they make precious baby clothes with the cutest accessories? Being on lock down with quadruplets sort of puts a damper on that concept. When we get out as a family, it is usually for a doctor’s visit or perhaps a neighborhood stroll. During these times, we garner quite a lot of attention. Four babies in TWO twin strollers aren’t terribly conspicuous when together in public. People marvel over them, but it’s not as if each baby gets admiring glances on their own merits. Honestly, it can feel like a bit of a freak show for us. And of course, there are always lots and lots of questions and comments. For the most part, onlookers are very polite and only complimentary. I beamed when one passerby said, “Oh what a blessing!” I replied, “YES- they are a blessing!” The occasional person throws out the rude question or comment. The worst was when we were on a walk and a neighbor shouted from across the street, “Are they natural?” It’s not that we mind sharing our story or keep it a secret. But come on, shouting across the street isn’t the best way to inquire. I’ve joked about making a banner to hang on our strollers that reads, “Bet ya’ got a lot of questions. Visit fourtoadore.wordpress.com for answers”. That could be a bit presumptuous for the average inquiring mind so I haven’t gotten around to that. I picked up baby sunglasses for everyone not because they are precious, but because macular degeneration runs in my family and our peepers need protection! I absolutely love being at home with our babies and watching them grow each day. Yet, at times I just want to get back out into the world a bit and I want my babies to see the world too. So, for the past few weeks we started a new mission, to take everyone out shopping individually. We have a system where my mom takes care of three babies while I take one on a quick errand. We time it so the baby is fed and changed, I take them out and get back before they realize it’s time to feed again. Of course, germs are still a concern even for just one baby. Thus, I take full advantage of cart sanitizing wipes and slather myself in hand sanitizer a bizillion times. Several weeks back when we decided to to this, I chose the most alert baby after feeding. Mason was the lucky guy that round. He and I made a quick jaunt to Kid to Kid to trade outgrown clothes for bigger ones. Then, we ran into Target. Of course my alert Mason conked out during the 20 minute car ride, but at least he was angelic the whole time. Later that evening, I decided to pick up a few groceries at Kroger. The evening here is affectionately referred to as “witching hour” because one or more of the babies is extremely fussy. Most of the time, the girls are the biggest offenders. I decided to roll the dice and take Rylin. I knew it would go one of two ways 1. she would enjoy the outing and behave OR 2. she would wail as if being tortured and we’d be forced to bail on the trip. Luckily, she LOVED it! For the entire 45 minute trip, Rylin was incredibly alert and appeared to be soaking in every bit of the novel environment. I think she also enjoyed rolling along in the grocery cart. I got two out in one day, leaving Harper and Sydney. Mason and I chose the best cart from the corral. 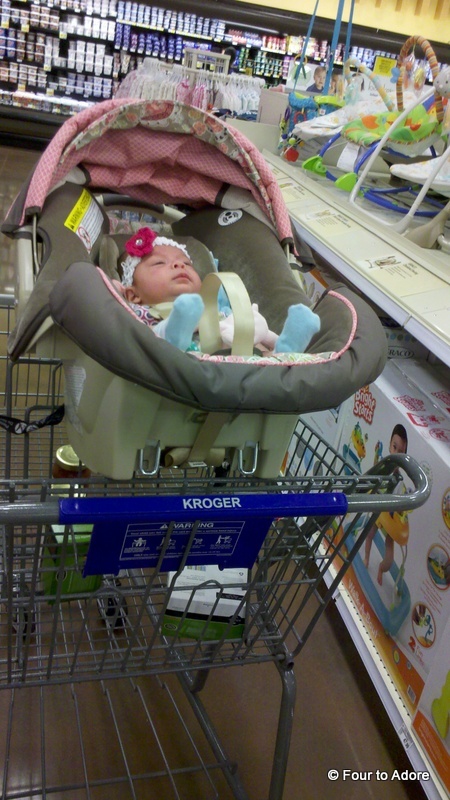 Rylin soaking it all in at Kroger. The next week, we had tons of outgrown diapers that needed exchanging at Target. I figured if I need to convince customer service to swap diapers for a larger size, I better take Harper since he is far bigger than my pixie, Sydney. So, Harper and I headed to Target. 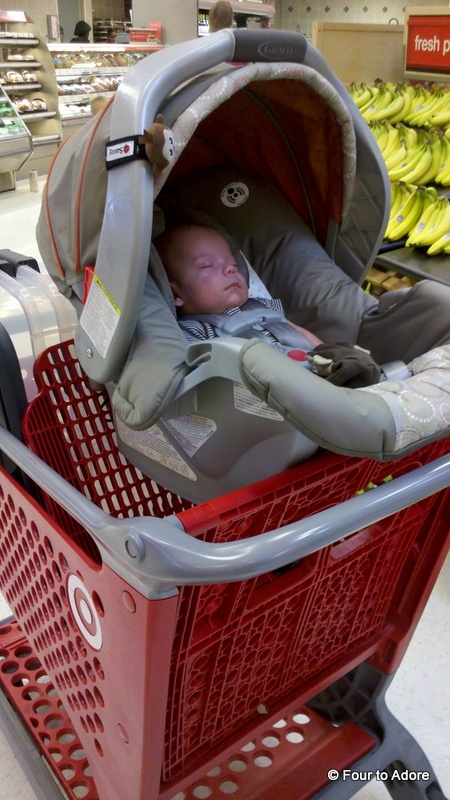 Like his brother, Harper passed out during the car ride and pretty much slept the whole time we were in Target. Every now and then he stirred and I thought, “Pllllllease don’t scream now….just a few more things” and fortunately he fell back to sleep. Finally, this past week it was Sydney’s turn. She and I hit Kroger on Black Friday while everyone else was in the big box stores trying to score mega deals. Sydney got many ooohs and ahhs, but I think it was partially due to her big red bow and Santa socks. She was the only baby who dared cry while out. Just when our cart was over half full, Sydney scrunched her face tightly and let out a shrill scream. 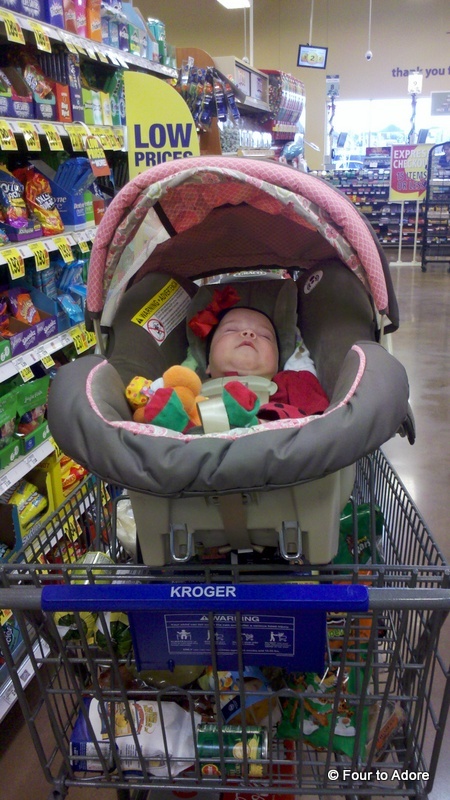 I averted bailing by pushing the cart at warp speed and lulling her to sleep. Mission accomplished! 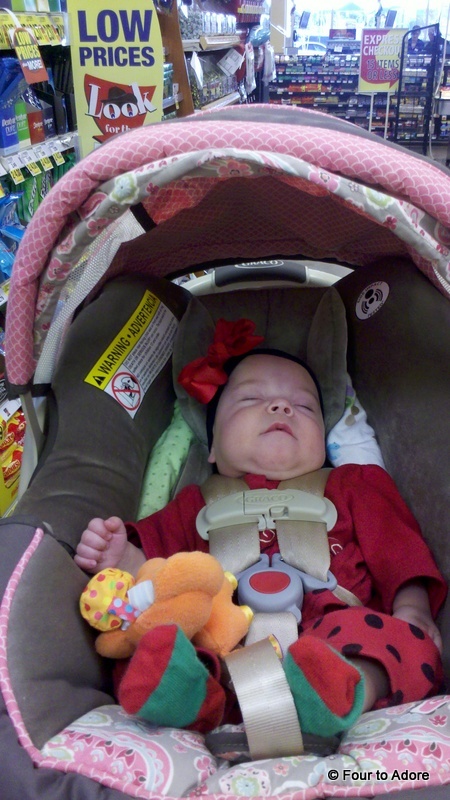 Harper was down for the count, but so cute at Target. This is after I got her to fall asleep. Prior to this,Sydney was alert and enjoying the scenery. 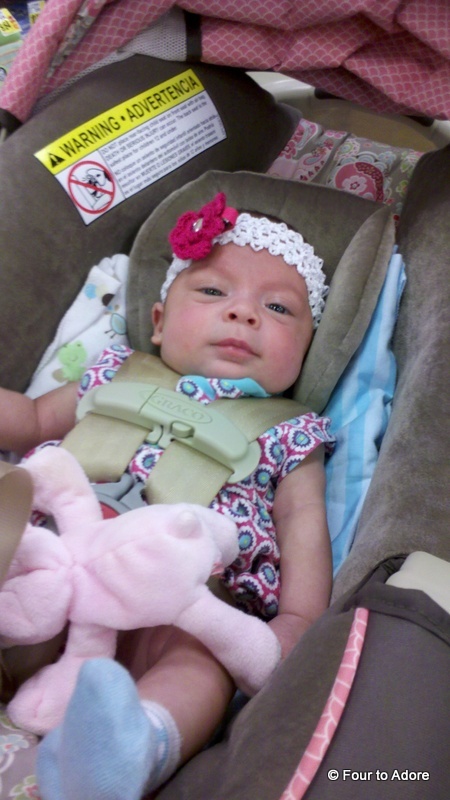 Sydney rocking her big red bow in Kroger. It’s been so much fun having individual time with the babies and hearing others admire them for who they are not because they are part of a pack. This is something I plan to keep doing as they get older so there is always individual time for them. As I am more skilled in baby toting I may venture to take two at at time! I recently saw a mom of twins leisurely rolling two store carts side by side, and thought to myself, “I can do that!” I figure if I can take two out at a time, finding a sitter may be a viable option too! I enjoyed seeing what it is like for the average new mom and being asked “normal” questions. You know, “How old is he/ she? What’s his/ her name?” That sort of thing. Now that everyone’s been out, I have to start again! ← Deck the Halls- Check! Hi Jane, I have wanted to say that before too, or “no, I had a c section.” I know they are curious, but no one asks if a singleton was natural. You said your daughter has mega multiples…..how many? AMAZING! We always say triplets have to be as tricky as quads because they out number one parents arms, but quints step it up because they outnumber BOTH parents arms. Wow two twin strollers! What are your plans for when they’re older? 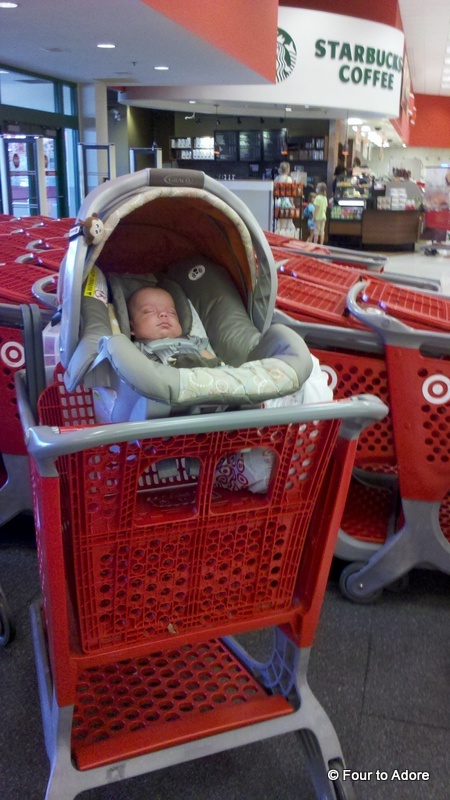 Is there a quad stroller or will you continue to use two twin strollers? I know going out with one baby is kind of weird for me. I always go out with both babies and I get lots of looks and comments (all good, none so invasive as “are they natural” yikes!). When I go out with one baby I am completely ignored, I may as well not have any baby on me! This neighborhood has so many young families that it is a normal sight to see people wearing a baby in the grocery store. There are even a lot of twin families in this neighborhood so I often find myself running into other twin families and we chat it up on the sidewalk! 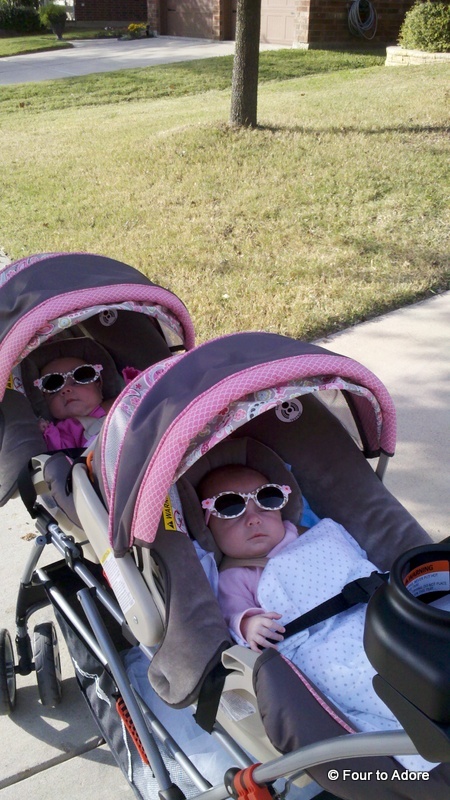 We have a quad stroller called a runabout, but we can’t use it until the babies can sit up. I am hoping to break it out in the spring, but I better get used to stares and questions! People just love twins! Twins are getting to be more normal, I think but they still get attention. I remember posing as twins when just two were home. Love this post! This is a great idea and it’s wonderful how you are putting it into action!! Hugs!! Love it. 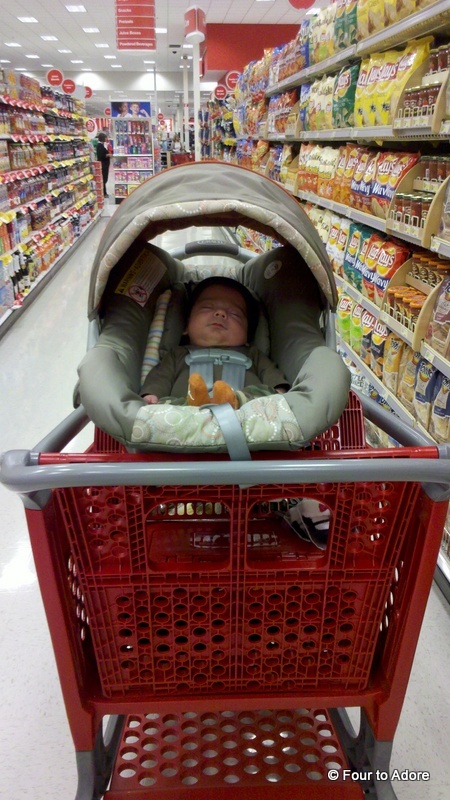 We have done the same and one of my goals, in fact, is to start getting out with a baby when I run errands during the week. I think, as moms, we need to get used to it too! 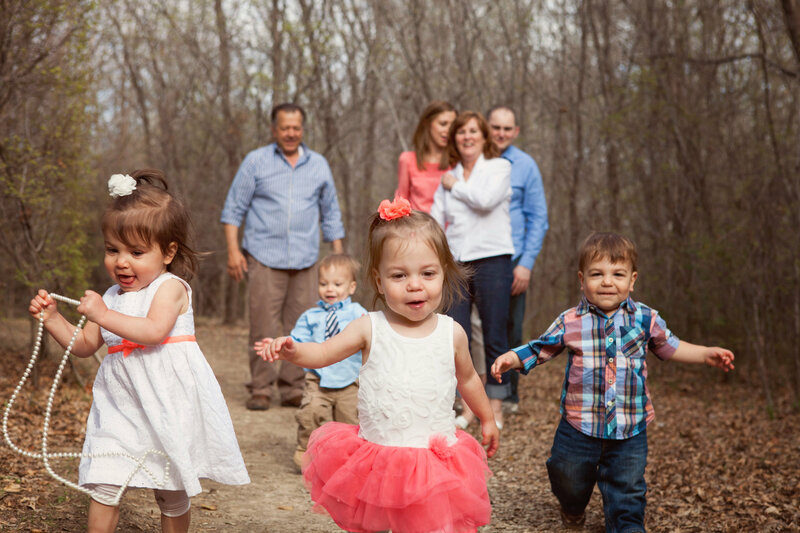 We’ve spent all our time in the NICU or doctor’s office and we ourselves haven’t experienced what life is like “outside” with babies in tow. Good to get used to one then take on two! I’ll be glad when spring arrives and we can ditch the quarantine-effect and haul our quads around. It’s gonna be work but fun! And I think we’re hoping to move late-spring. Hello quad playdates!! Hi Debbie! We so loved your visit. Too bad you can’t come more often I was thinking of you the other night when I put our ornament you got from Germany on our tree. I hope you have a wonderful time traveling. Tears in my eyes from reading your stories. Love you all.